On the weekend of Oct. 26 through 28, a three-day horror film festival took place at Edmonton’s not-for-profit movie theatre, the Metro. This festival’s main goal was to break the stereotype of the “final girl,” which is a common character in most horror films. Not necessarily a well-developed or complex character, the final girl is often victimized, sexualized, or both, though she still manages to survive. As added incentive, the festival also offered a raffle with all the proceeds donated to the Sexual Assault Centre of Edmonton and held a live Q&A session with one of the directors of Ginger Snaps, Karen Walton. 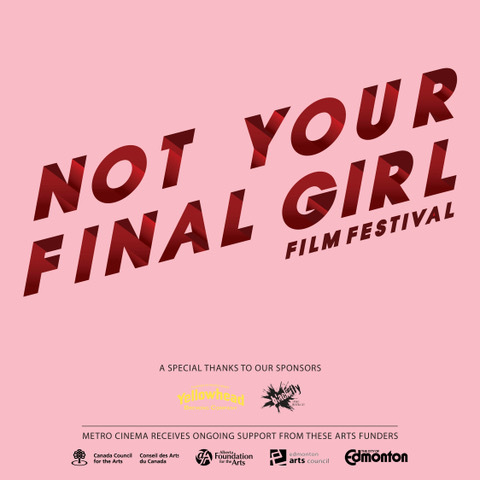 Not Your Final Girl Film Festival curators Georgia Coughlin and Nicole Boychuk chose three specific films that saw feature female protagonists or antagonists as multi-dimensional characters that play a more prominent role than the stereotypical final girl. The first screening on Friday evening was Ginger Snaps, a coming of age story about sisters Ginger and Brigitte, whose lives are turned upside down after Ginger is attacked by a werewolf on the same night she gets her period for the first time. The act of Ginger becoming a werewolf is actually a metaphor for her reaching puberty. She embraces her changes in behaviour, reveling in defying society’s expectations of how young girls are supposed to behave. The second movie, shown on Saturday evening, was the 1977 film Suspiria. Like Ginger Snaps, Suspiria has become a cult classic film within the horror genre. Its premise involves an American ballet dancer traveling to a ballet academy in Germany. Little does she know the academy is actually a front for a supernatural coven of murderous witches. The majority of characters in this film are women, with a few men making small appearances which offer little significance to the storyline. This film is an example of a heroine who starts out as weak and naïve, but is able to emerge from a terrifying ordeal strong and victorious. It may not be the most original plotline, but is quite forward-thinking for a movie released in the ‘70s. Viewers who saw the completely restored original at the festival will also be able to watch the adapted version of Suspiria when it comes to theatres this November, offering a unique opportunity to watch both old and new versions on the big screen and compare which one they liked better. The third and final film, shown on Sunday evening, was Goodnight Mommy. Viewers are constantly questioning the motives of the mysterious mother character — is she an imposter? Or, if she is the twins’ real mother, what happened to her? For the majority of the film her face is swathed in bandages with only her eyes visible, successfully shrouding her in mystery. Although typical mothers are portrayed as loving and warm, this character is cold and sinister, though not enough to make viewers completely root against her. This psychological thriller remains mysterious and complex throughout its entirety, leaving viewers still searching for the truth long after the credits roll. When asked about the future of the festival Coughlan stated that they would love to do it again and are already discussing what they would like to do differently; however, the decision of a repeat festival would depend on the continued support of Metro Theatre.